The second half of the La Belle Assemblée August issue is finally ready for you, on September first. Oh well, better late than never. Please don't forget to read the London report from Ackerman's, and those from Weimar and Paris. As you may recall from the last post, the August issue contains just two pages of fashion news (p. 101-102), and only one plate, despite the title reading "prints" in the plural. Today we focus on fashion news. Real advice, really useful advice, this month, for once. Some months the author goes into diatribes about the usual issues: too much novelty, vanity, blah, blah. I wonder if women then yawned or giggled reading them as much as we do? Or did they feel chastened, or a little of both? GENERAL OBSERVATIONS on FASHION AND DRESS. pinner found on ricardo.ch, but original source page is gone. This is not the season for fashion or novelty in dress; splendour and gaiety are under an eclipse, and we have only to enumerate the several modes and articles of dress most in request among our fashionable fair. For the promenade satin spencers are becoming very numerous, and on account of unusual chilliness of the atmosphere during the last month, pale colours have given way to dyes of a more glowing and luxuriant hue and texture; they are made in the wrap form, with collars, and rather short in the waist; as the season advances it is imagined that rich silk Brandenburg trimmings will receive an added portion of fashionable approbation; what appeared heavy and superfluous in summer, will confessedly add much to the comfort and elegance of the winter costume. Pelisses, mantles, tippets in satin, or sarsnet trimmed with lace, and French cloaks, are all in equal estimation; the light transparent shawl and scarf will soon be most appropriately displayed, over a spenser or tippet of white or coloured satin; it is essential to that idea of delicacy, always so interesting when connected with the female person, that the autumnal winds should not be suffered to sport too lightly with it. Morning dresses have undergone no variation, except that in addition to buttoning down the front, they are frilled entirely round with narrow cambric; some we have observed unconfined before, and to these we give the preference, as more graceful, and setting off the figure to more advantage. The Roman sandal is a very proper appendage to this style of dress. Dinner or home dresses are mostly made in cambric, muslin, Opera nets, figured gauze, and Merino crapes; low in the neck, fitting the shape with great exactness, either entirely plain, or with a simple gymp trimming, with short sleeves and short French train. Evening dresses of white satin, velvet, fine muslin, sarsnet, crape, or gauze, with white satin boddices, and short lace sleeves and small trains, trimmed with lace or beads, worn over white or coloured satin slips; the glove is worn very short of white kid, as is also the slipper. Small aprons in lace, crape, or muslin, ornamented with ribband, are much worn. Lace and sarsnet tippets are still a necessary appendage to dress. Feathers are very generally worn, beads are a little on the decline, silver flowers and ornaments prevail. The dresses continue to be worn much off the shoulders, the sleeves not extravagantly short; the bottom of the dresses are frequently trimmed with lace; above which, when in muslin, is a rich worked border. Bouquets of natural flowers in the centre of the bosom, and short Grecian waists must not be omitted mentioning. Some difference prevails in the mode of wearing the hair; it is no longer closely braided and twisted up behind, but carelessly festened up by a comb; the ends curled and left to fall negligently in the neck; and curled before in thick round curls. In respect to jewellery, gold chains are in great estimation, as is a plain string of large pearls, long enough to encircle the throat with ease, confined by a brilliant clasp. A profusion of rings are worn, and brooches in every device. Emeralds are a favorite species of ornament, and garnets are extremely becoming to the complexion; watches are very numerous, rather smaller than last summer. Roman sandals and Kemble slippers of coloured jean, with satin and kid for dress, are all the varieties worth remark in this order of dress. The prevailing colours for the season are jonquille, pink, blue, violet, and amber. Colors. Jonquille, pink, blue, violet, and amber. Amber is new this month. Pink, blue, and violet never go out of fashion, nor jonquille, either. Frills. Frills and texture are back, and they will remain an important feature through most of the rest of the Regency period. The early Regency liked flat, two-dimensional bands of applied "work", embroidery, what have you, and we see this a great deal in evening dresses in 1811. Draping of the dress fabric supplied the texture. As dresses narrow, draping moves to added fabrics, whether in added drapery, as in the April issue, for instance, or in frills. Hair. Note the thick round curls in front. We will see these over and over and over as the years pass, big, thick sets of ringlets to each side of the face. The portrait above shows the effect clearly. Kemble slippers. No, not Fanny Kemble slippers. 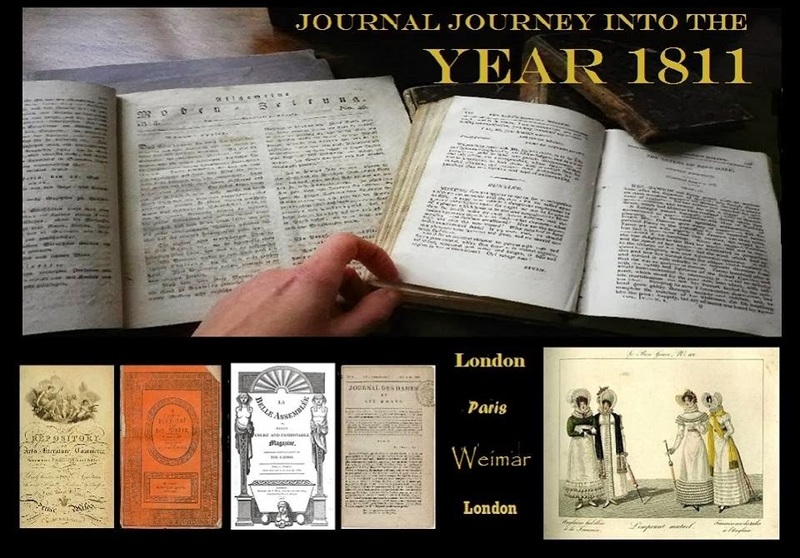 That Fanny was born in 1809. Could the John Philip Kemble, sister to Sarah Siddons, a well-known actor of the period, been the inspiration for this name? Layering. It was not enough to wear a spencer alone. One layered it with a shawl or scarf or tippet on top. The month's fashion plate demonstrates the principle. The model is wearing a dress, then an open-fronted coat, and has layered a light, delicate shawl on top. In this case the coat has a special ribbon or tie that loops up the scarf. A little contrived, but it shows that the layered look was a deliberate draping effect. We've had lots of draping all year long, and this is just another way to drape. 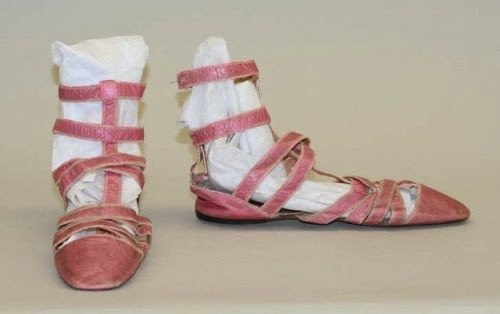 Roman sandals. High fashion items, sandals, always a bit outre. Here Roman-style sandals are the thing. 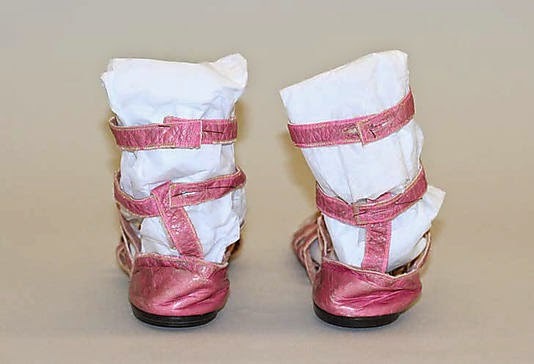 "Roman" has usually meant that the straps continued up the legs, as worn by Roman soldiers. Here's an example from the Metropolitan Museum of Art, which makes me smile. Pink straps? The perfect way to feminize a very masculine cut. This pair is in silk and leather. For more about sandals, try the Dreamstress' account. Metropolitan Museum of art, No. 2001.576ab. Spensers. A hot item once again as the weather cooled in England. 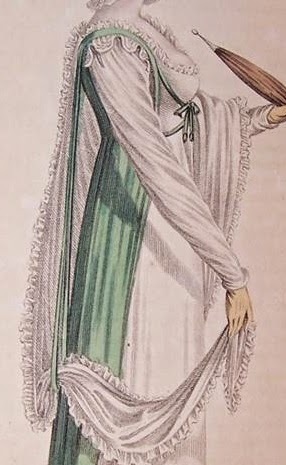 Wrap-front spensers go in and out of fashion during the Regency period. 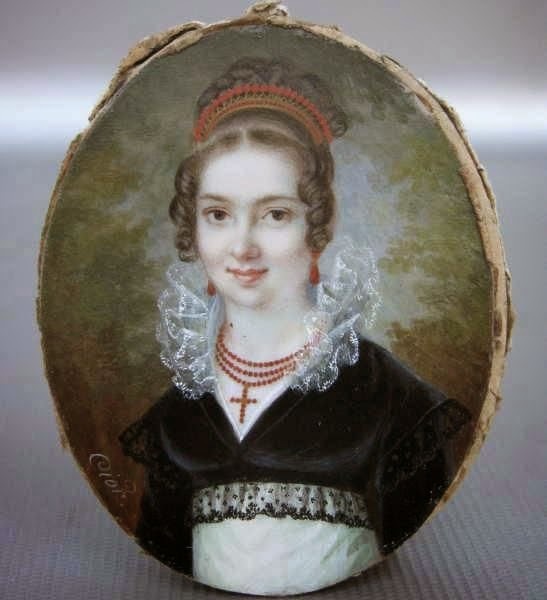 The image, "Portrait of a Lady", above, may be barely wrapped or not wrapped at all, but gives a nice idea of the rich coloring and the lace plus opaque fabric effects that were so popular. This example is "rather short in the waist", as described in the magazine, so you can see how attenuated it looks. Trains. Still here, in home, dinner, and full-dress occasions. I had long read that trains went away after 1805, but not so. However, trains will disappear shortly, and dresses start to stand out stiffly. 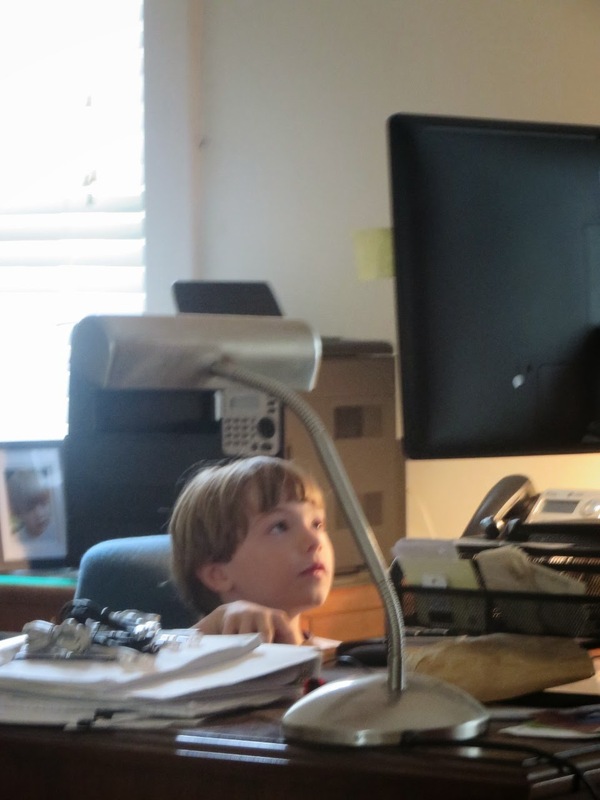 I leave you today with a small boy at his father's desk, watching U. of Kentucky sports clips on the computer.